Chef Naim Bellan focuses on an international menu at the Giraffe Room Lounge and Restaurant located at the Inn at Great Neck in Great Neck, New York. He graciously takes time out from the kitchen to share a few of his tempting recipes for Lentils and Rice with Fried Onions, Tomato and Cucumber Salad, Chicken Mona Lisa, and Bourbon Steak. Naim Bellan grew up in Haifa Israel, and he brings international flavor to the Giraffe Room Lounge and Restaurant where he has been the Executive Chef for the last 7 years. 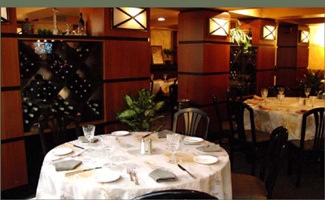 Prior to joining the restaurant at the Inn at Great Neck, he owned several restaurants and a catering company. In April 2010, I had the opportunity to meet with Chef Naim Bellan after having dinner at the restaurant. He grew up with an appreciation of good food, as his mother is an excellent cook who still enjoys cooking for her large family. 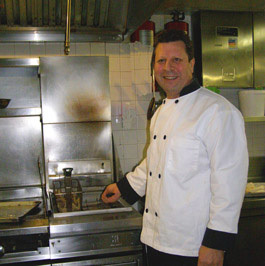 Chef Bellan has continued to hone his culinary skills, and after 30 years in the business remains passionate about what he does. In his free time, he enjoys spending time with his four daughters, and loves going to the East Village in New York to eat with friends. He is also part owner of a vineyard and winery in Galilee, Israel that will produce wines to raise money for charity. They planted their first vines one year ago, and he hopes that they will be able to enjoy their first harvest in 2012. Chef Naim Bellan graciously shares a sampling of his recipes to provide a delicious taste of the Giraffe Room Lounge and Restaurant. Method: Wash the lentils and the rice, and add both to a pot. Cover with water 1-inch above the lentil and rice mixture. Add salt and pepper and cook until lentils are rice are cooked. In a sauté pan sauté the julienne white onions until golden. Season with salt and pepper. Presentation: Top the lentils and rice mixture with the sautéed onions and serve with the Tomato and Cucumber Salad. Method: Toss together in a bowl and serve. Method: Sauté chicken breast in butter until golden. Add artichoke hearts, red pepper, and garlic, white wine, lemon juice, and chicken stock and cut asparagus. Cook through and finish with butter if desired. Method: Sauté onions and mushrooms until golden brown. Add bourbon and reduce. Add beef stock and reduce. Add cream and butter at the end. Garnish with minced fresh parsley. The Giraffe Room Lounge and Restaurant is open for Breakfast daily from 7:00am until 10:30am, Lunch daily from 11:00am until 2:30pm, and Dinner from 5:00pm until 11:00pm. Read about the Giraffe Room Lounge and Restaurant and the Inn at Great Neck in the Restaurants and Hotels and Resorts sections. Read about the Gold Coast in the Destinations section. © May 2010. Luxury Experience. www.LuxuryExperience.com All Rights Reserved.